I have a dear friend who rearranges her furniture as a way of paving a new way for herself when she needs a change. In my small house it seems to me there’s only one way things can go, but in her small house I like to tease her that the combinations are infinite. While I may not be very imaginative when it comes to moving my furniture around, I sure do like to change up the usual fruits–or vegetables–in a recipe. It’s kind of like playing an old song in a different key, or using an off-beat arrangement or choice of instruments. That’s my excuse for this recipe. My interest in vegetables in dessert was re-sparked by carrot cake I made from Straight Up Food’s Carrot Cake Donut recipe, from which these bars get their soul. While resting during my afternoon nap time, I got to daydreaming of the zucchini muffins I used to make, adaptations of Susan’s St. Patrick’s Day Zucchini Muffins and Happy Herbivore’s Chocolate Zucchini Muffins (which I made with gluten free flours and carob powder instead of cocoa powder). But it isn’t zucchini season. Instead, I’ve been eating a lot of really nice organic broccoli. The stalks have been so nice and tasty, almost sweet, nearly all the way down that I’ve saved them, thinking I’d make broccoli slaw. But then, oh then, I asked myself the question that led me down the road to these unqiue bars: how different than zucchini would shredded broccoli stalks behave in a cake, a bar, or a muffin? I’d read (and tried) bits of finely chopped kale in muffins so why not broccoli? It was so wierd it make me laugh, and I just had to see what would happen if I tried it. I’ve been adding fruit to savory dishes for so long with such good results, that I suppose it was only a matter of time before I transposed that tendency and started venturing a little bit more outrageously into putting vegetables in my dessert. Of course there’s sweet potato, and carrot, and even zucchini. But broccoli? If I can put pineapple in a stir fry with it, then I might as well try it as an ingredient in a healthy fruity dessert or breakfast bar. This is what comes of rearranging food instead of furniture. Chop and pit the dates and chop the apricots. Put them in a small bowl and pour about 1/4 cup water over them. Let them sit to get soft, about 15 minutes. Grind up your oats in a blender or designated coffee grinder. Mix all the dry ingredients together. Peel the broccoli stalks and grate them in the food processor with the grating blade. The grate the apple while you’re at it. Sprinkle lightly with a little lemon juice and set these aside. Add the date mixture to the dry ingredients and combine. Fold in the shredded broccoli stalks, apple, lemon zest, pistachios and raisins. Spread the batter in a square baking pan, 8×8 or 9 x9. Bake at 350 for about 45-55 minutes (55 minutes seems to work best in my oven but yours may be faster). After the cake cools a bit, sprinkle the top with cinnamon and ground ginger. Cut into bars. Store in refrigerator. 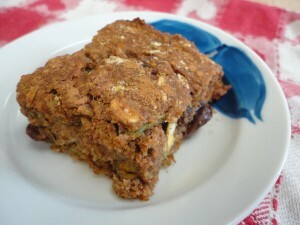 Like most gluten free baked good, these bars just get better the next day. Usually, I try to give some substitution options. With these bars, though, I think this particular combination of ingredients is the best one. You could make them sweeter using all medjool dates, or you could try it with all gluten free oats, or sub walnuts or maybe pecans for the pistachios. But the quinoa flour, pistachios, lemon, peel, apple, dried apricot, and mace really give it something distinctive and more complex combination of flavors that works well with the broccoli. Because broccoli stalks, let’s face it, aren’t as sweet as carrots, dropping them into a recipe made especially to go with the taste of carrots may not quite hit the same flavor mark. But then a day after I made these a good friend I haven’t seen in months came over for a delightful catch-up visit. Though the daffodils aren’t quite up yet in our gardens, the sun was finally shining and she came to the door with a fistful of grocery store daffodils about to burst open in her hands, to celebrate how close we’re getting to real Spring. As I put the daffodils in water, I told her I had saved the last two pieces of Cathy’s carrot cake for our visit, and I laughingly admitted that I had made another version with broccoli I was sure I would be eating all of myself. But when she heard I’d also attempted these broccoli bars, she wanted one of each. And then she wanted the recipe. So my eclectic experiment with a serious green vegetable turned out to be truly tasty to someone besides myself–someone who is a healthy eater, but not vegan. Some people might not be as graciously intrepid as my friend was about full disclosure, so you might want to offer a taste before you rattle off the list of ingredients. Either way, though, broccoli and I never had it so sweet. We posted to our FB page! Thanks! Though I don’t often comment, rest assured I’ve been reading your blog for awhile now, and thoroughly enjoy every word! Is the measurement for broccoli for the shredded product or stalks pre-shred?? Hi Deb, thanks for your question. My measurement is for the amount of broccoli stalk I shredded in my food processor from whole stalks I saved. I think you could use the preshredded, but I would pick the cabbage out of it, since it usually comes with a little carrot and cabbage in it. Carrots could stay I guess if you wanted. Also the prepackaged is more dry than shredding your own in the food processor, so you might have a shorter baking time. Not sure who they’d moisten up in the process of baking–maybe differently than a fresh grated stalk. Thanks, Lee, you made me laugh. Indeed! To boldly go where no vegetable–or plant-based cook in her so-called right mind–has gone before. . . I really did like them. Go figure. LOL Glad you’re intrigued. If you do try them, let me know what you think! Made these today and they’re definitely bold and interesting. What an AMAZING idea! Like you, I’ve done so many things with zucchini, but never thought to do broccoli! Will definitely be trying these out – thanks! Thanks Megan! I’m so glad you like this off-beat idea and might be bold enough to try it out! I love the name of your site, too, and it looks great–so positive, and that’s the “lion’s share” of keeping on track. 🙂 You go! Very good this, and i lov e all those ingredients, and energy bars too. i have never understood why people say medjool dates and not dates. could you please just explain the difference and why that is enphasised? Previous post: Is “Significant Benefit” Enough?